Researchers at every stage of their scientific careers encounter unknown terms and concepts and require background, contextual knowledge to progress. But finding one’s path through a literature search can be overwhelming. On the way from hypothesis to discovery, a researcher can easily be caught up in the morass of siloed information, untrusted sources, and site hopping just to explore a single unknown idea or topic - the result is a lost thread where information is elusive, and knowledge is never truly acquired. That’s why we created ScienceDirect Topics. This new research enhancement allows different areas of knowledge to connect and form an exploratory network—the optimal environment for intuitive learning. Using this network, ScienceDirect Topics anticipates key topics vital to understanding and suggests critical contextual sources to foster and speed insight. Combining cutting-edge technology and essential content, ScienceDirect Topics is a research enhancement that brings the path of discovery to the user. Topic pages on ScienceDirect are generated using innovative automated approaches for information extraction and relevancy ranking. ScienceDirect Topics reveals succinct and selected contextual information from reference books, surfacing valuable content when and where it is needed in the research process. It brings comprehensive, credible and interdisciplinary knowledge into a user’s natural research workflow. ScienceDirect Topics improves the overwhelming and disjointed research process encountered by researchers, academics, and students. Using smart technology and innovative algorithms, it integrates book and journal content chosen by natural language processing tools to create an interactive, seamless and convenient reading experience. ScienceDirect Topics enables librarians to better guide researchers on their path to discovery. It provides a necessary bridge between journals and books to speed research, foster insight and improve the understanding for your patrons. 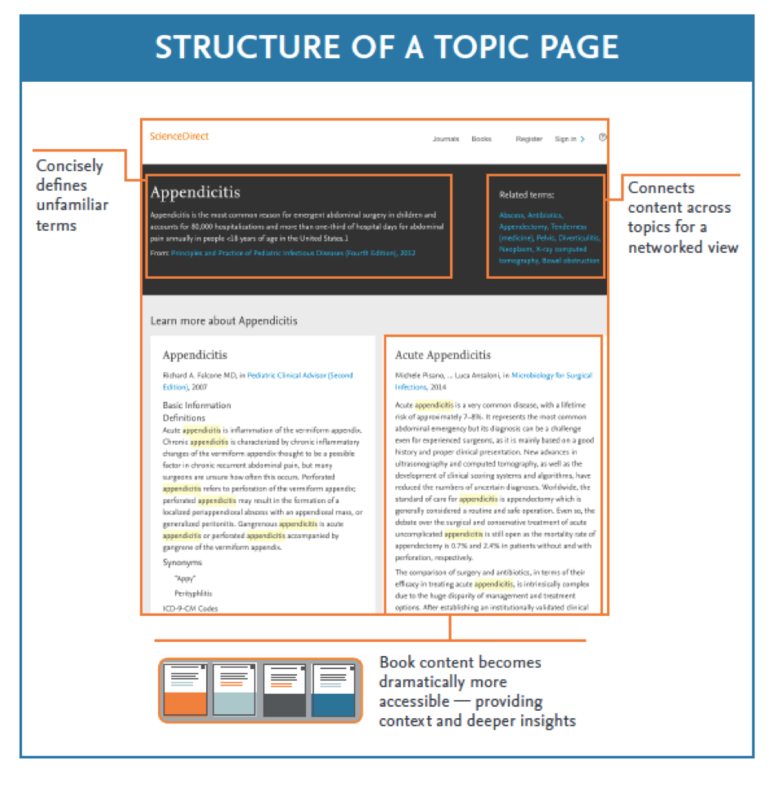 ScienceDirect Topics provides librarians with the most complete picture of researchers’ needs, revealing the true picture of demand for content. Library patrons need a selected mix of resources – journals, books and reference works – to successfully conduct research, teach or master their coursework. ScienceDirect Topics enables access to content from our authors’ books. It brings researchers in touch with important and relevant book content by creating bridges from journal articles and search engines to books. With machine-readability and metadata, your essential chapters are seamlessly placed within researchers’ natural paths to discovery during journal or online searches to foster and speed insight and improve understanding of a topic. Article: Is your literature search telling the whole story?